Wisconsin’s housing market is having its best year in more than a decade. While rates remain low, demand remains high. 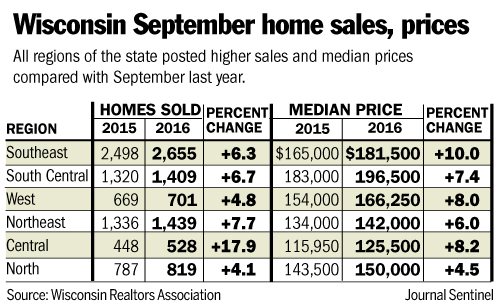 According to the Wisconsin Realtors Association, September sales climbed 6.9% from September of 2015, while the median price increased 7.9%. With interest rates near record lows, it’s hard to tell when rates could climb again. With demand high and supply relatively low, now could be the perfect time to consider selling your home. Give Best Realty of Edgerton a call today at 608-884-8468 for a free market analysis of your home to see what you could get in today’s market. Check out our Facebook Page for more information or if you would like to stay up to date with current listings, open houses and more!